We want to acknowledge YOU- the diverse scholars, practitioners, writers, researchers, scientists, artists, and funders as well as thinkers and makers who make science of team science a thriving community. The goal of the 2019 SciTS conference awards is to acknowledge outstanding work from all corners of our growing field. To be eligible for this award, you must indicate on your proposal submission that you wish to be included in the competition. Attendees will vote during the poster session to determine the poster awards. 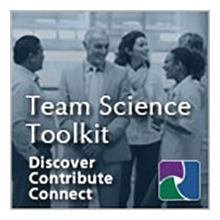 The ability to communicate our work to others is an essential part of the science of team science field across roles and career stages. To be eligible for this award, you must indicate on your proposal submission that you wish to be included in this competition. SciTS Abstract Reviewers will nominate pertinent abstracts, and the SciTS Planning Committee will judge them based on originality, significance, and ability to successfully communicate ideas in an engaging way. © Copyright 2018 Science of Team Science. All rights reserved.